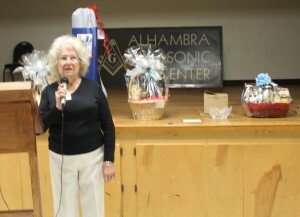 Rose Marie Markus, President of the Alhambra Historical Society welcomed members of the Alhambra Historical Society, the Monterey Park Historical Society, Historical Society of Temple City, the Dinsmoor House, San Gabriel Historical Society and the Ramona Museum of California History and their guests to this joint event held at the Alhambra Masonic Center in Alhambra on March 28th. A picture of Alexander on his Chariot was displayed for the guests to enjoy. This picture was a labor of love for Rose Marie Markus and David Oswald, a local photographer. The picture is on display at the Alhambra Historical Society. 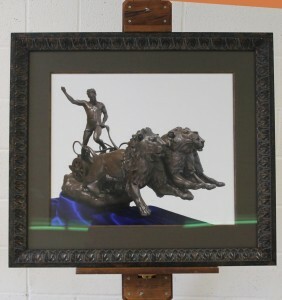 The bronze statue was created by Eli Harvey an American sculptor, painter and animalier. Harvey was born in Ogden, Ohio, a Quaker community in Clinton County, to William P. and Nancy M. Harvey. He was born on September 23, 1860 and died February 10, 1957. Jim Iwaki from the Monterey Park Historical Society led the flag salute. 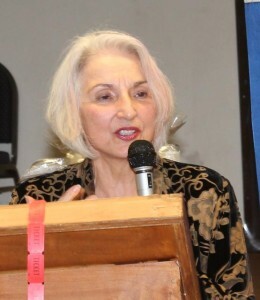 Rose Marie Markus spoke about this joint meeting with the various historical societies in the San Gabriel Valley. She introduced Alhambra Councilmember Barbara Messina and former San Gabriel Councilmember Mary Cammarano to the guests. She thanked David Oswald for his support and hard work on their joint project. 95 guests enjoyed good conversations along with a delicious dinner provided by Charlie’s Trio, a famous dessert provided by Claro’s Italian Market and chances to win the several door prizes provided by each society. 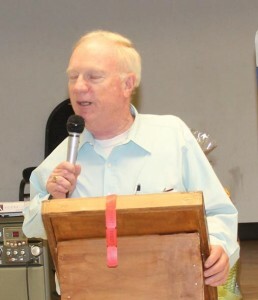 Glenn Barnett, the guest speaker, was introduced to the audience as a Mark Keppel graduate and a product of the Alhambra School District. He is a historian and teacher with three published books. He researched the life and times of Secondo Guasti, a local wine maker. The honorable Secondo Guasti Sr., was born in Mombaruzzo, Italy on May 29, 1859. In 1883 Mr. Guasti arrived in California by way of Mexico City. Two years later Mr. Guasti settled in Los Angeles where he met and later married Miss Louisa Amillo, daughter of a prominent hotel owner. The couple was married on August 23, 1887. Mr. Guasti entered the wine industry shortly thereafter conducting a modest operation on Alameda near Second Street. Mr. Guasti used information gathered from his father “himself a prominent vintner in Italy,” to build what would one day become the premier wine operation of its time. In 1900 the Guasti operation was incorporated under the name of the Italian Vineyard Company with Mr. Guasti serving as President. The Italian Vineyard Company began acquiring land in the Ontario area from Antonio Signorio who owned 2,000 acres encompassing the entire area, which is now Guasti, parts of Ontario and Chaffey. Mr. Signorio joined Mr. Guasti in establishing the Italian Vineyard Company along with Spirito Bodrero another native of the Piedmont province. Other founding members were Ambrosio Vignolo, Giovanni Vai, Angelo Bessolo and Joe Pagliano. 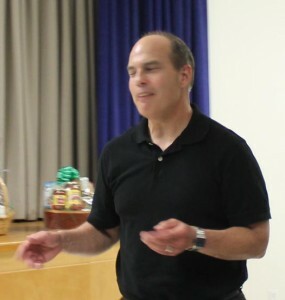 One of the myths associated with the establishment of the Italian Vineyard Company in Ontario was that Mr. Guasti and partners were embarking upon a brand new endeavor, this not entirely true as the aforementioned Mr. Signorio had planted the first vines associated with the new concern prior to incorporation. What transpired as a result of their collective drive and experience is a testament to their vision. As the head of the concern, which grew to include a massive 5,700 acres Mr. Guasti began constructing what would become known as the town of Guasti. Built to house the families of the men who toiled in the field’s for the IVC. A school, Catholic Church and living quarters sprung up housing some 1,200 Italian and Mexican laborers in 1912. The endeavor sealed the legend of Secondo Guasti as the most visible member of the IVC staff. The Italian Vineyard Company shipped its goods internationally prior to the passing of the 18th Amendment better known as the Volsted act, which ushered in prohibition. The new era for the IVC included a continuation of its operation as if prohibition applied to everyone but them. Through a loophole, which allowed the consumption of alcohol for personal medicinal purposes and altar wine, Guasti’s fortune continued to soar. So much so that he became an international celebrity. On two occasions, the king of Italy honored his achievements conferring upon him the orders of Cavalier and Commentatore. 1922 Guasti met and befriended Benito Mussolini whom he was said to admire greatly. Mussolini later conferred upon him the title Grand Ufficiale, a rare occurrence, as it is the highest Italian honor of its kind. Mr. Guasti passed away at the family home in Los Angeles on August 29, 1927 after a brief illness. His wife Louisa with whom he had enjoyed 40 years of marriage “nearly to the day,” a sister Philomena, son Secondo Jr., and a daughter, Mrs. William Orcutt survived him. Louisa Guasti lived to see the end of Prohibition but their wine industry never recovered. The land was sold off after her death in 1937. Carol Jones, Director of Visitor Services at the Guasti Mansion gave a brief history of the mansion that is located at 3500 West Adams Blvd. in Los Angeles, which was the Bel Air of the times. The villa sat on two and one-half acres that was planted with grapevines from Italy. Originally an Italian Renaissance mansion, this villa has a history of its own. It was built between 1910 and 1913 by artisans from Italy and Mexico. The building was filled with beautiful art and architecture, the physical beauty reflects a bit of the majesty of the soul. In 1937 Busby Berkeley, a Hollywood director and choreographer purchased the villa as his residence. The property was also used as a rooming house for young actresses. In 1947 the First Baptist Church was located at the villa. In 1949 the Mutual Aid Society used the property as a care facility for retired doctors and their wives. In 1974 the Movement of Spiritual Inner Awareness purchased this property. They keep up this building, which is designated at a historical monument in the 1980s. In 1989 Carol Jones became a new resident at the home. The 1994 Northridge Earthquake damaged the building that has since been repaired. In 2000 they designed and built a Labyrinth and Gardens in the yard, which is now opened to the public. In 2016 over 5,000 people visited the house and the gardens. Our docents will happily share the beauty and story of the “Guasti Villa,” offering tours of the main floor and grounds. Their church gives back to our community and hold special events at the villa. 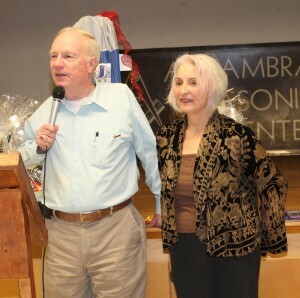 Glenn Barnett and Carol Jones answered questions from the floor. 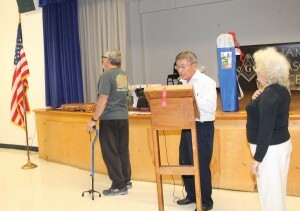 The event ended with several lucky winners claiming their door prizes. Rose Marie Markus thanked everyone for attending this special evening.